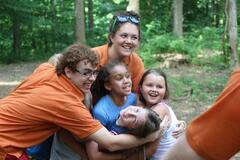 because camp still makes a difference! Pecometh does everything possible to provide quality programs that are affordable. Our donors help to ensure that can happen year after year. Your gift helps us support ongoing operations, provide camperships, upgrade facilities, and prepare for the future. Click "Continue to Donor Login"
If you are not a first-time Pecometh donor: please use the form to the right to let us know that you created an account. Once notified, we will transfer your past history to your new account. Please note, our online system allows users to make one-time donations, make pledges, and schedule recurring donations. If you cannot remember your password to the account you previously created, please contact Jessica Lutz. You can also make a one-time Guest Donation without logging in. Let us know you created a new online donation account!